The library | House by the water. Move over home theatre. The library is back! Library deliberations started months ago with the intent of picking a colour scheme because our builders will paint the house interior before handover. I was going round in circles with too many options. Moody colours, versus bright and natural. Formal shelving including cabinets, versus informal, open shelving. Since this room is mostly for The Nice Wolf, I held him hostage with my “Library” Pinterest folder until he picked his 5 favourite pictures, focussing on the mood. Picture sources: 1-3 Tumblr – Original sources not found. 4. Pottery Barn. I ditched one slightly daggy picture, but as you can see he’s been trained well. He selected pictures that are not only consistent with each other, but fit with the plans for the rest of the house too. Photograph by Shannon McGrath. Designed by studiofour as shown on Arch Daily. This book shelf design is almost perfect for us. 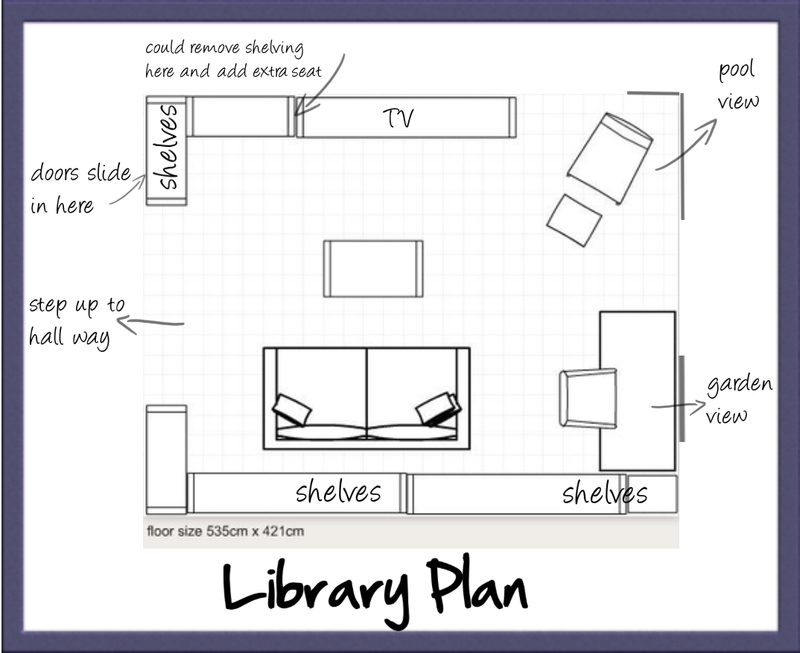 But since it is a library and my husband has hundreds of books that he rereads, we want at least 2 walls of shelving. I’m visualising one wood-backed wall, as above, (to hide sliding doors) and the other wall, without a back to avoid wood over-load. I spent one whole afternoon playing with the layout and the mood board. I tried to squeeze in a second sofa, to no avail. Australian made desk (Domayne) and drawers (Mark Tuckey). My old sofa looking fresh with some new linen. Eames Lounge Chair or similar. This space is tempting me already. The plan you have in mind Jo is great. I particularly like that whole wall dedicated to books: so inviting. Love the mood board! I think the size of our libraries are about the same. I like the layered rugs, I think it’s a great concept. My only concern would be how roomba handles it, but I think it would cope. Unfortunately, I need to go back to square 1 with my mood board as Mr. Trixee only liked one of the pictures that I’d pinned! Oh I love it! Beautiful photo with the full wall of books. Your color tones are so perfect for a library. I see your doing blackbutt floors. At the moment that is my favourite choice. Are you doing hardwood or engineered? If you are doing hardwood, what finish will you do? Oh and yep, LOVE the library. Hello Nat. We will use hardwood blackbutt (I prefer the blackbutt from Eastern Australia) but I haven’t chosen a finish yet. I need to see it, so I’ll have to do that sometime when I’m in Perth. I will be looking for a matt look. When will your floors go in? I shall be watching keenly! I also want a matte look an something that doesn’t darken the wood like some finishes do. As for when they will be going in, I have no idea sorry Johanne. I suppose that will be towards the end. I love your style Joanne. Pottery Barn one of my favourites. They have great style. We have a second one opening in Sydney soon. What software did you use for your library layout? Thanks “Our family build”. I’m not very savvy with proper layout programs so I used a couple of cheats’ methods! Free too. 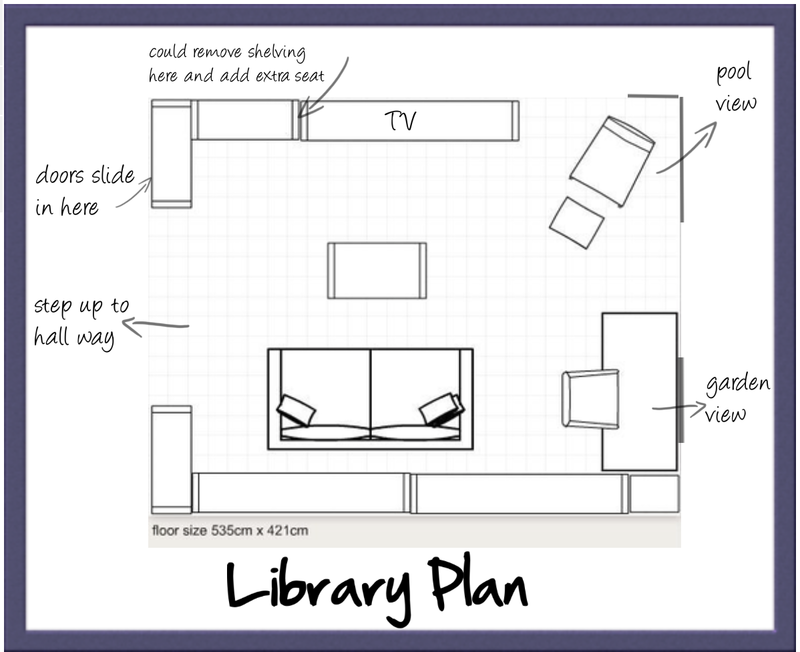 I used the room layout tool on Jardan’s website (using their furniture with the same dimensions as the furniture we’ll have). Then I clipped what I made there onto Polyvore to add the text. I’m sure there are a zillion better ways to do it than this. Polyvore is no good for room layouts by itself, but great for mood boards because you can clip whatever you like onto it very easily.